From Green Lantern (Vol. 5) #41 – 46, Hal has to confront a mysterious force that is turning entire worlds into stone. Along the way, he inadvertently picks up a rag-tag team – the bounty hunter Trapper, the aristocrat Virgo and the spacecraft Darlene – which gives the book a rather Guardians of the Galaxy feel, although the group could do with a feminine touch (and I don’t mean the reluctant Darlene). Eventually, Hal discovers that the source of the problem is an unlikely old foe but together with the assistance of yet another adversary, manages to resolve the situation. The story (by Robert Venditti) is fairly intriguing though it seems to move at snail pace whilst the art (Billy Tan & Mark Irwin) is functional at best. It just seems that a story involving events of cosmic portent should have a more epic or majestic style. 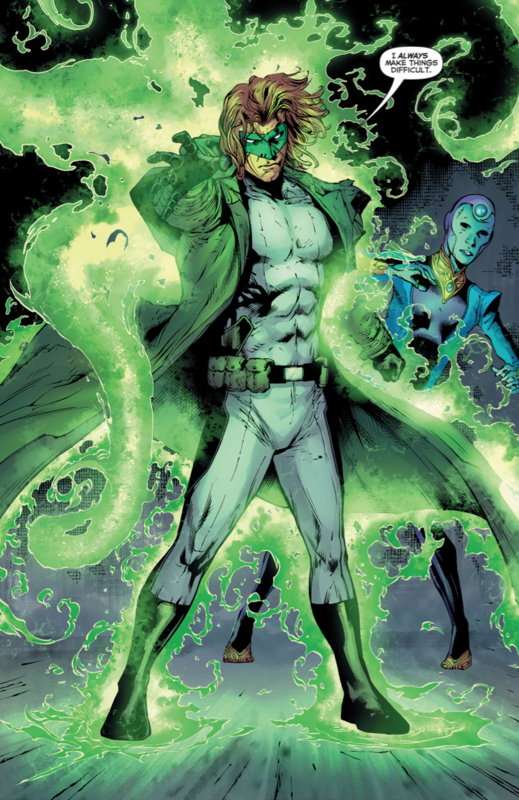 Overall, as usual, this reboot seems transient in nature and it should not be long before Hal plays a leading role in the Green Lantern Corps once again. In the meantime, Hal Jordan: Renegade will have to run its course.